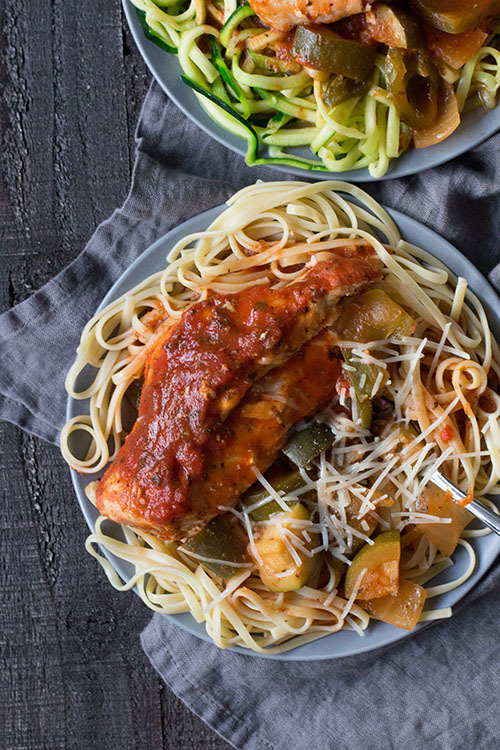 Your whole family is going to love this recipe for Easy Crock Pot Chicken Cacciatore. It’s delicious, healthy, and only requires six simple ingredients. Here’s my personal take as a busy mom…you can’t go wrong with recipes that have less than 10 ingredients and can be prepped ahead of time. I totally give bonus points for healthy recipes with less ingredients. 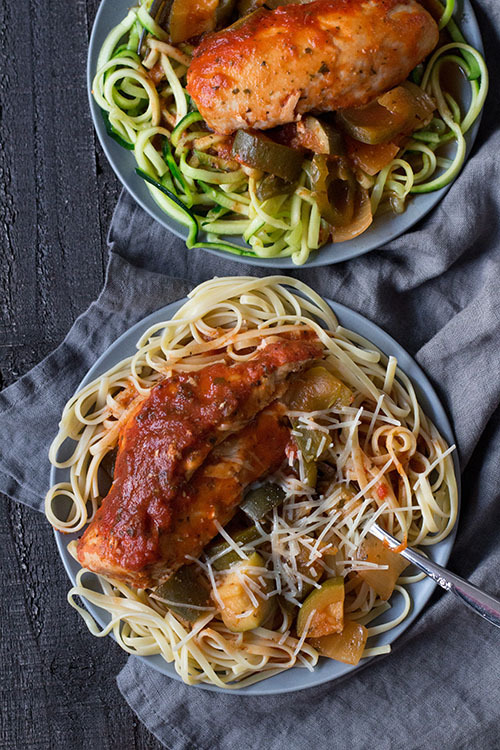 This delicious and family-friendly chicken cacciatore tops the charts with six simple ingredients and is a sure crowd pleaser. I use a tomato and basil spaghetti sauce with mine and love the rich flavor of the sauce paired with the zucchini and pepper! The veggies cook down with the sauce in the crock pot and make it extra flavorful and healthy. 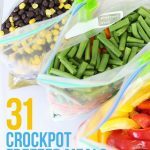 Simply add all of the ingredients to your crock pot in the morning or assemble and freeze for a busy weeknight. This recipe freezes great and can be prepped in 10 minutes or less, so I’m including both options below. Cook fresh or freeze to cook later. Serve with spaghetti noodles and parmesan cheese. To knock it out of the park, add a side salad and a fresh toasted baguette. 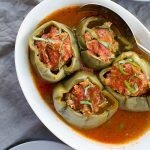 Combine all ingredients in crock pot and cook on “low” setting for 6-8 hours or until chicken is cooked through and tender. 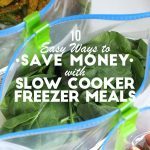 Label a gallon-sized plastic freezer bag with the name of the recipe, cooking instructions, and “use-by” date (which will be three months from the prep date). Add all ingredients to your freezer bag, seal, and freeze. 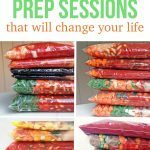 When ready to eat, thaw overnight in refrigerator or in morning in water. Add to crock pot and cook on “low” setting for 6-8 hours or until chicken is cooked through and tender. Hi, I googled Italian seasoning, and this was the very first result: The main ingredients are basil, oregano, rosemary, and thyme. is it what you recommend? because I think I have to make it at home! Yes, that sounds good. I’m just not sure how much to add of each one. Any way to spice this up? Going to try fennel. 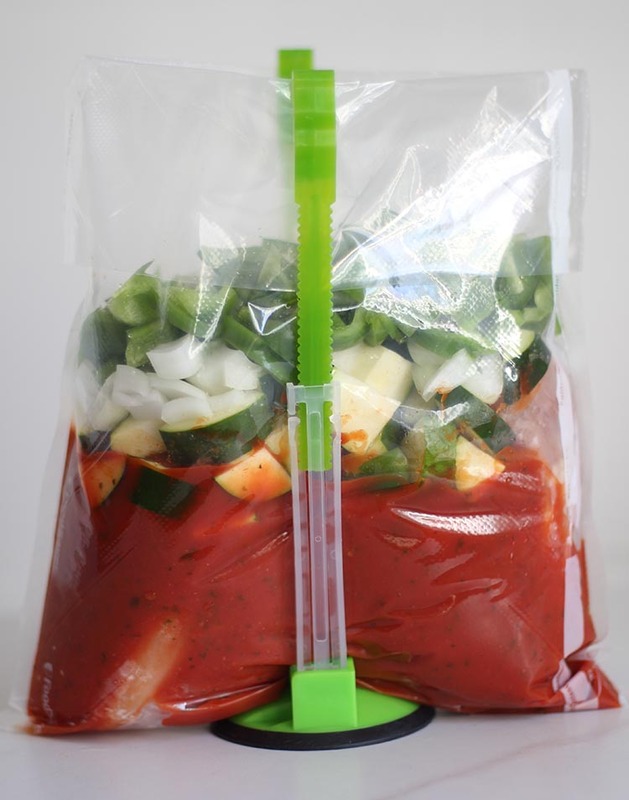 What kitchen tool are you using in the photo to hold up your freezer bag? I need this! Thanks. I have tried freezing zucchini and it just turns to mush, would recommend adding the day of the get a better flavour, otherwise a great recipe! Have you tried freezing it in this recipe? I’ve never had a problem.